Green Vigil Foundation is a registered non- profit organization with expertise in environmental domain and vision of a shared sustainable future on the planet through education & mobilization of all stakeholder groups. The Foundation’s work focuses on the most difficult challenges faced by our planet: from climate change, water sustainability, food security to ecosystem degradation, biodiversity loss & sustainable use of natural resources. We have been working on the EarthEcho Water Challenge since 2012. Since then we have been continuously monitoring the water quality of major lakes of our Nagpur city namely Futala Lake, Gandhisagar Lake, and Sonegaon Lake. We monitor the quality of these lakes year long and document the resulting changes due to various Indian religious customs and festivals. India is a country with distinct and unique cultures in various parts of country, labeled as a country of an amalgamation of diverse deities, cultures, religions, customs, cuisines, and food. Amongst various festivals, one of the biggest across India is Ganpati Utsav. Ganpati or Ganesha is the most worshipped deities in India. To celebrate his birth Ganesh Utsav is celebrated every year for 10 days. For this 10 long day event Ganesha Idols are installed in large numbers of households and communities and each day worshipped and offered with Nirmalaya (flowers, garlands, leaves, coconuts fruits etc…). After 10 days, the Ganesha Idols and all the Nirmalaya offered for 10 days are to be immersed in flowing water, such as rivers and lakes, which marks the new beginnings and removal of obstacles as per Hindu religion. 4. The Nirmalayas that are dumped degrade and lead to anaerobic condition in lakes, leading to depletion of dissolved oxygen levels and eventually fish kills. 5. The oil used to worship God is also immersed which forms a layer of oil on the water body, restricting atmospheric oxygen diffusion, leading to lowering of dissolved oxygen levels. Similarly, other festivals that have a customary ritual of immersing idols and Nirmalaya in lakes are Devi Visarjan (Goddess Durga), Krishna Visarjan during Janmasthami and a few more. 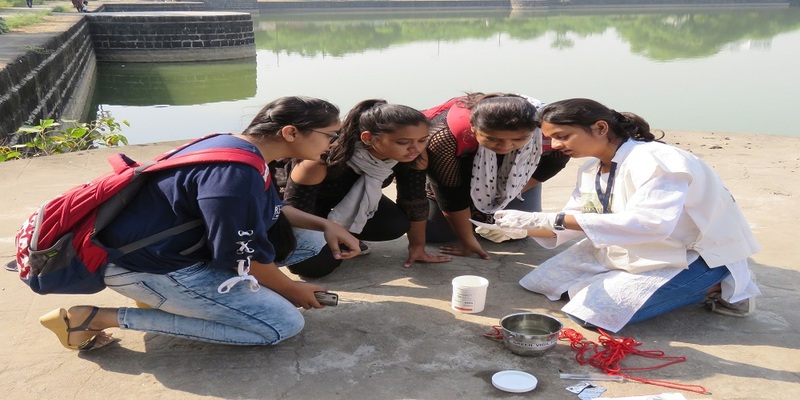 Majorly being Ganpati & Devi Visarjan, we analyze the water quality of these three lakes before and after Visarjan to analyze the impact on water bodies. The dissolved oxygen levels of Nagpur city lakes that we have analyzed before Gnapati Visarjan in past three years have been in the range of 4-5 mg/L. The dissolved oxygen levels dip to 2-3 mg/L after immersion of Idols and Nirmalaya in water bodies. This leads to disturbance in the lake ecosystem and water quality deteriorates to a huge extent. On the occasion of World Water Monitoring Day on 18th September 2018, we have conducted water monitoring campaign of Futala Lake. Our water monitoring program has been widely covered by local and national media. Taking notice of our study, the local Government body has initiated cleaning of the said lakes since 2014.